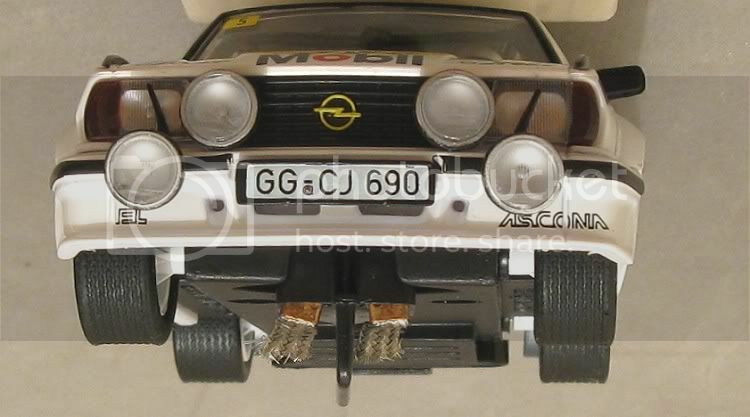 The Opel Ascona series of cars started life in 1970, and being the progeny of GM, it was destined to surface around the globe as various models and, over the years, as various shapes. They were to be small engine models in the 1200 to 1900 c.c. range and were aimed at the medium sized family car market. In the UK it had a Vauxhall badge and some cosmetic front end alterations (although still built in Belgium!). In South Africa it was sold as the Chevrolet Chevair and Chevrolet Ascona. 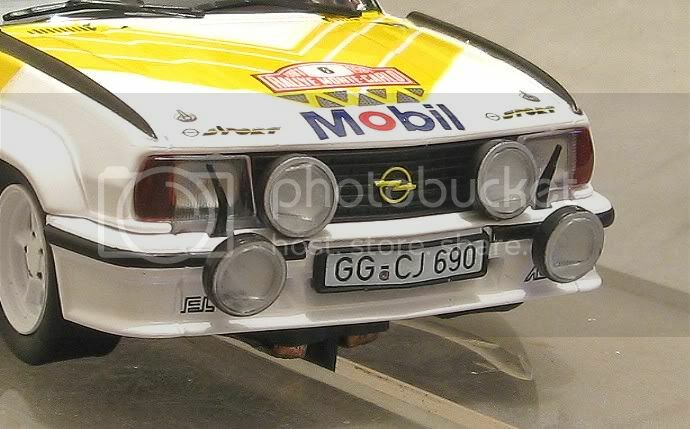 In South America it carried the Chevrolet Monza badge and even the local Holden Camira had more than a lot of Ascona in it. As with all cars, all forms of motorsport are perpetually looking for a car that will dominate the current pack, and privateers and factories alike demonstrate a flurry of motorsport activity until the chosen subject succeeds or fails in its bid to be top dog. The Ascona ‘B’ was conceived at a motoring crossroad. This was a time when small and medium sized car manufacturers were making the transition from rear to front wheel drive, the Ascona falling into the former category, and its forte, Rally, was also switching sides en mass. None the less, GM Europe stuck to their guns and chose the rear wheel drive Ascona ‘B’ as their next European Rally Championship contender. The car was developed and some massive changes had to be made to get the car competitive. The engine was woefully underpowered and more problems arose when Cosworth were commissioned to design a sixteen valve cylinder head for the 2.0 litre block. There was still not enough grunt and some radical upgrades where made. The 2.0 litre block was bored out and the crankshaft from their 2.3 litre diesel engine was fitted. At 2.4 litres capacity and with the Cosworth 16v head, the Ascona was becoming a potential monster. The first fuel injected models produced 172 kW and switching from Bosch injection to carburettor delivery saw the 2400 c.c. engine power output increase to 254 kW!! That is 340 bhp in old money!! 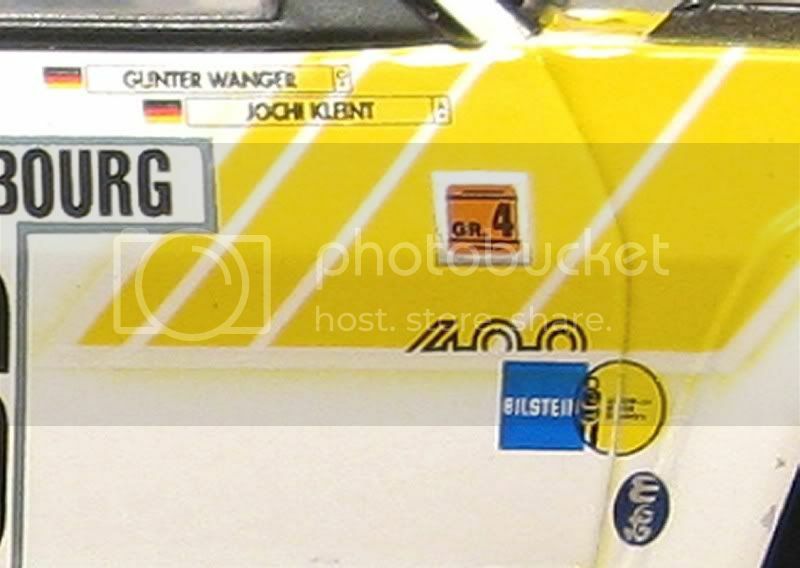 The body was fitted with lightweight panels and upgraded suspension by Imscher and at the hands of then World Rally Champion Walter Röhrl the Ascona was driven to victory in the 1982 WRC championship. By 1984 the Audi Quattros were producing more power than anyone and the Ascona, along with several other marques, had passed their use by date. 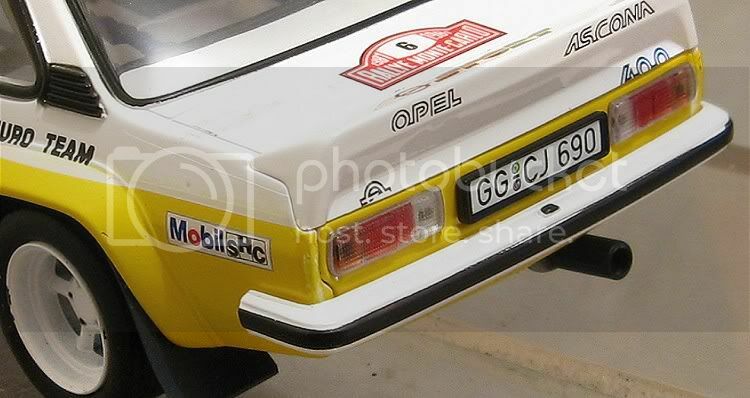 The greatest claim to fame would be that they were the last rear wheel drive car to achieve World Rally Championship status. 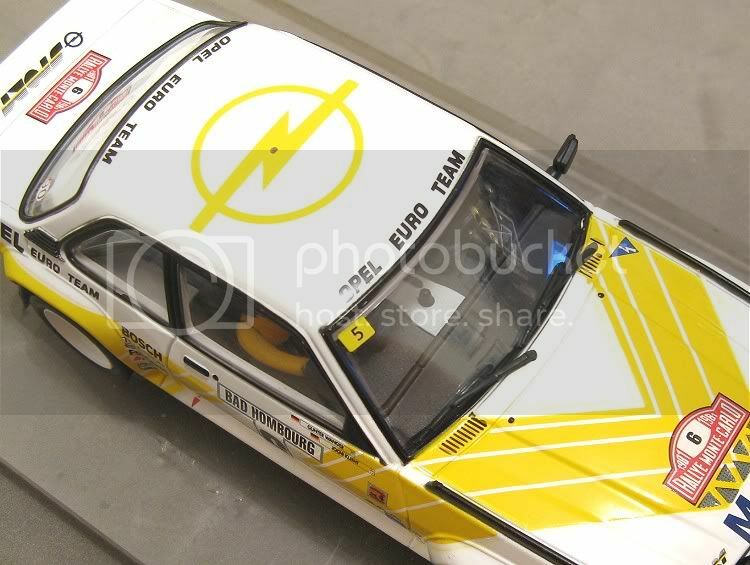 The model in question is the factory Ascona 400 driven to third place by Jochi Kleint and Gunter Wanger (ERC champions 1979) in the 1981 Monte Carlo. 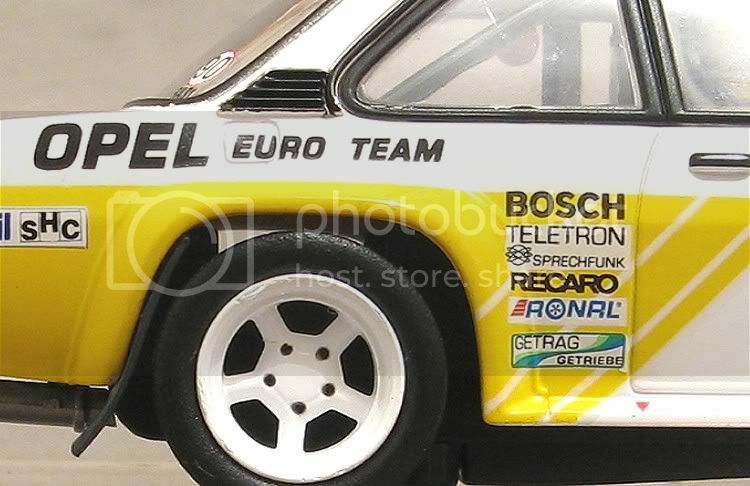 Revell also do the 1982 Walter Röhrl Rothmans car. 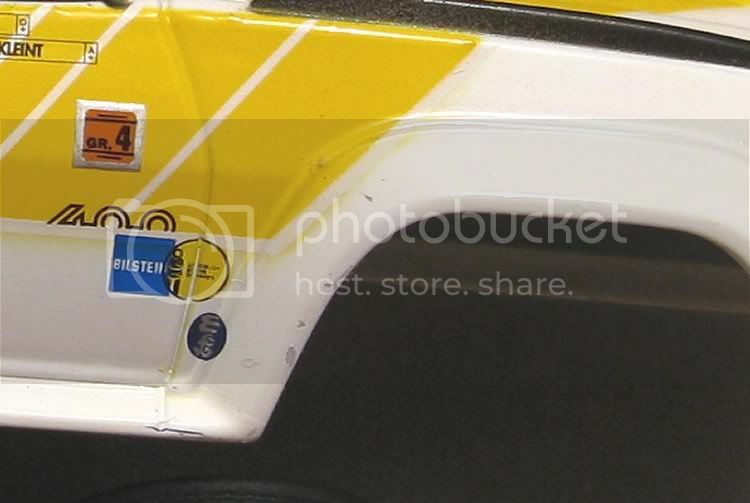 But sadly, as is the way of the slotcar world, the Rothmans decals have not been applied to that model. So what have we got? I anticipate Revell model arrivals as they are improving year on year, and his model is no exception. It shows some more improvements over the older models and all going in the right direction. I always look forward to getting these models competitive too, and there is room with this model to make some improvements which would place it at the pointy end of the results! But firstly, let’s get it out of the box! Out of the box it shows all the signs of a nice model with a diecast makers background. 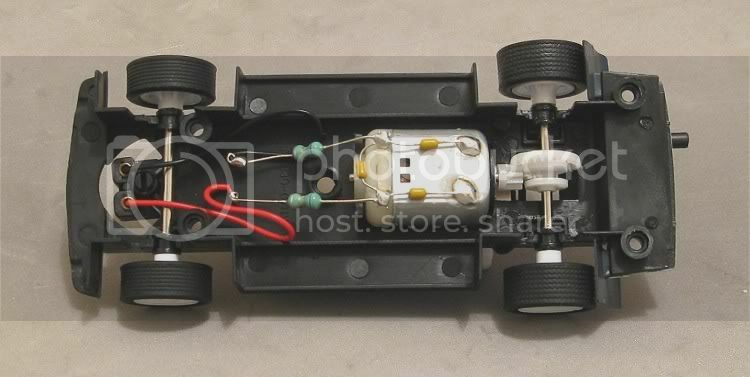 Not quite as good as AUTOart but still better than a good many slotcars in its price range. The tampo is very good and being a factory sponsored car there is no tobacco advertising missing from the model. All other features are well modelled. Detail is crisp and clear and all the nice little touches have been added. 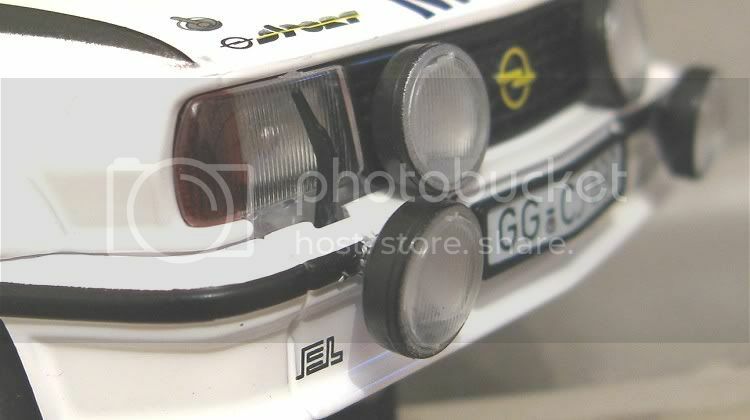 The eighties style headlight wipers are well modelled as are the front lights themselves. Grille badge and numberplate look quite natural and the driving lights, although exposed, are well modelled to. It’s here that the first defect presents itself. 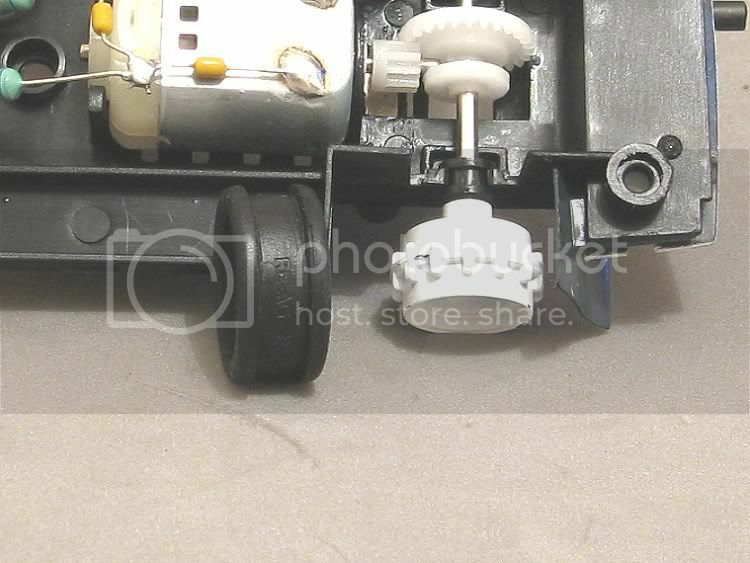 The driving lights must have been wet when they were assembled (lacquer/paint?) as each light has a tide line in them where the paint or lacquer has gravitated to the bottom of the light. Mind you, it is a bit reminiscent of the old lights when they used to fill with rain water!! The rear bumper is crooked too, maybe a bit of extra care in the assembly stage is needed? 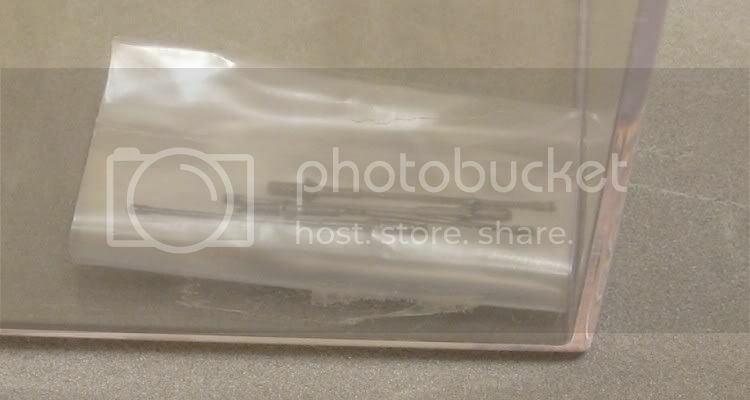 The clear parts are good too. Once again, no more greasy fingerprints left behind on the inside after assembly. In the cockpit area is a half drivers tray. Not too bad a job made here either. 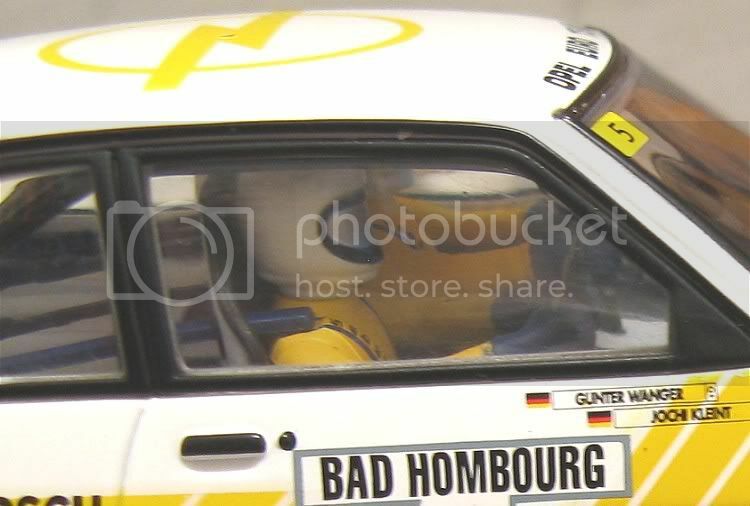 Both occupants are strapped in with five point seat belts and the drivers suits matching the livery. There is also a very well detailed roll cage and dash but they are almost indiscernible in the cockpit. My next disappointment were the occupants heads. The visors have been silvered over and detract from the overall interior. 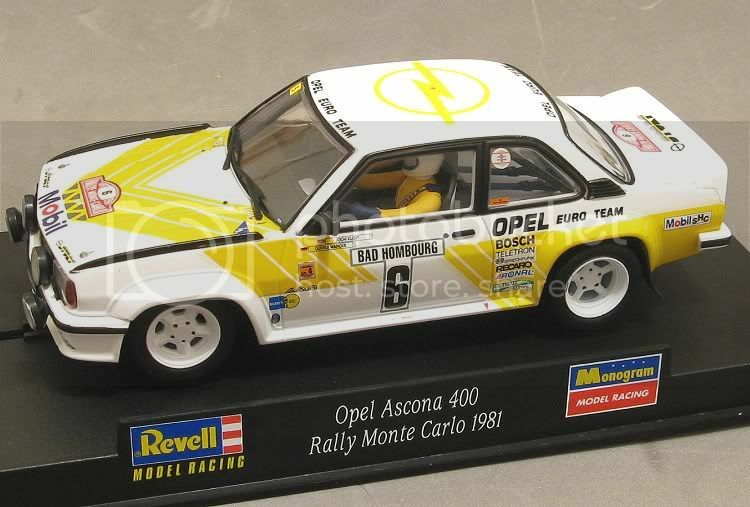 There is no aerial on the model from the box but to my pleasant surprise there was a small plastic bag stuck to the side of the display case carrying no less than four, yes four aerials, maybe enough to restore aerials to other retired racing models?? Lastly, from the outside, I was disappointed to find defects in the clear coat. The model finish is very crisp and almost unmarked on the outside, but the back edge of the right hand front wheel arch carries several marks in its clear coat which indicates some sort of damage after painting. Pity! Underneath are more revelations, there is a simple and effective chassis and the basics well laid out. The traction magnet is not overly strong on Scalextric classic track but there is the opportunity to shim it down to increase traction. You will have to make the shims though, there aren’t any in the box. There is a cute rear silencer for the exhaust and up the front is one of Revell’s regular guides. The guide has the same characteristics as the McLaren M6a. It works fine as it is once you set it up, but I decide to make the same mods as I did with the McLaren. I modified the braid slots. In this model’s case I also trimmed almost 1.0 m.m. off the flag itself. Hopefully it will help when running it on commercial track like Scaley and Ninco. I also shimmed the guide down so that it was achieving full depth when standing on all wheels. Once inside the model there are no more surprises, good or bad! The motor is held firmly in its mounts and the contrate cut out in the chassis is that wide that the axle can be reversed for what ever reason, if needs be!. There are no lights in this model and the basic fitting of the lenses in the body is not suited to converting. The axles are fairly snug in their bushes but if you were anticipating board track racing, I would be inclined to glue the rear axle bushes in place. The tyres, as soft and as well made as they are, do readily turn on the wheels, and it will be a case of gluing them in place I fear! Removing the tyres reveals Revell’s individual approach to making wheels. Unusual and as yet, unexplainable! But I will give Revell 9.863 out of ten for its wheels. 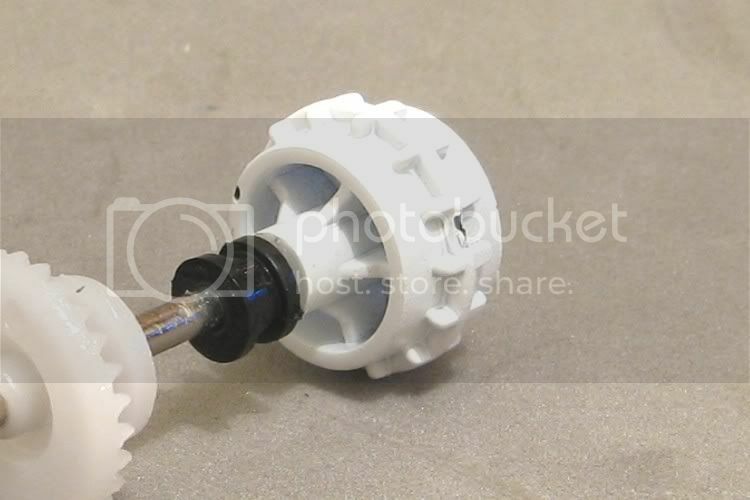 For plastic wheels they are round and concentric! Not only that, a look behind them reveals possibly the most durable and sturdy plastic wheels you are ever likely to encounter on a 1/32 RTR model. On the downside. 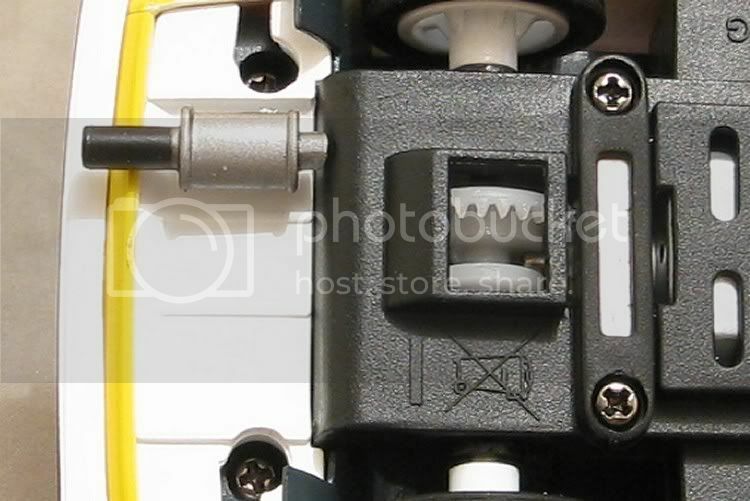 One of the wheels on my model has a chip in the lacquer revealing the black plastic wheel material. No matter, sixty seconds with a small paintbrush may well disguise it. Tyres are nice and soft AND round, and have a shallow tread pattern moulded in. I also anticipate they may well prove to be useful as they are. Time will tell. The pinion and contrate are natural finish nylon and are very quiet in operation. The pinion having a solid collar to reduce the risk of splitting. 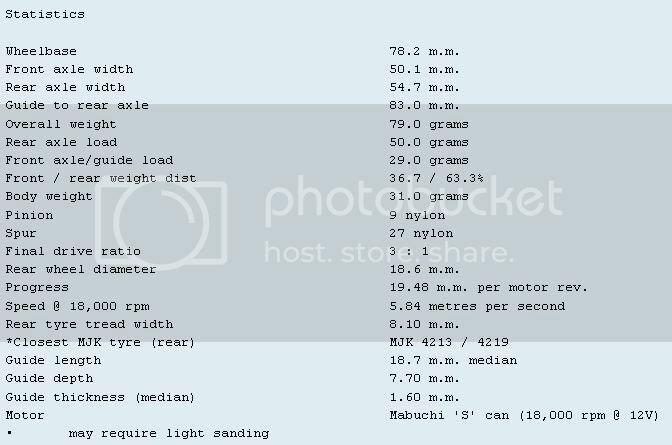 Lastly inside, the motor is standard Mabuchi and there is plenty of space to put some ballast if you are a non magnet racer! Purely from a competitive aspect, there are one or two jobs which can be carried out while the top is off. First, as always, is a run round with the oiler. Never screw a body back on without oiling first! The body post screw holes in the chassis were taken out a little with a small rat tail file. Not only that. The post recess was chamfered on the inside and the body posts chamfered on the outside. This will help the body float once the screws are backed off a little. This is handy to have for both magnet and non magnet racing. I also smeared a drop of clear enamel in the post screw threads. The screws are a little loose in the posts and this should help hold them in once the body is loosened. So what is it like almost SOOB, on the track?? 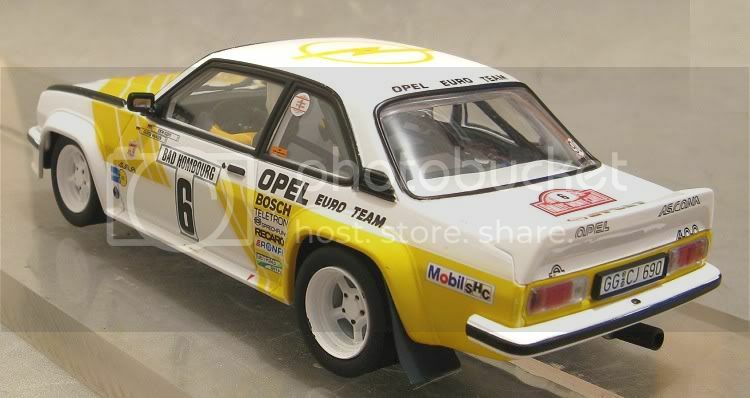 Yet another very nice model from Revell and one that can be run alongside such peers as Renault 5 Turbos, Opel Mantas and Sunbeam Talbots. If those who are engrossed in GT, Nascar and LMP and all other manner of fast cars could tear themselves away for one minute, they would find there are some very pleasurable models amongst the also rans. I would not be so naive to suggest this is a race winner straight from the box, but, like several models before it, and on the more technical tracks of South East Queensland, I would say that it wouldn’t take much to make this a contender. Also, being a can end drive motor makes it a candidate for an NC1 upgrade. It is also equipped with other basics which make it a good platform for improvement, and I suspect I may just spend a little more time on it!! Stay tuned for the track test.